If you live in the country or anywhere near it, you know the sound of crickets. It’s pleasant, and soothing. That’s distinct from the soft “crack, crack” of Cricketts, which I for one find pleasant and reassuring. The Crickett™ is a scaled down .22 rifle designed for kids. A single-shot bolt action, it’s today’s answer to the Chipmunk rifle of a generation ago, made light and with a very short stock for children’s arms. Military small arms expert Peter Kokalis said the Chipmunk was the most important rifle of its time, because it was designed to get The Next Generation into the safe appreciation of responsible firearms ownership. I have to concur. The Crickett carries on the tradition. It comes in plain grayish black, or camo for hunting, and even in pink, which my gun dealer friends tell me actually does appeal to little girls and those who buy guns for them. A week ago I was at the Enfield Outing Club in Enfield, New Hampshire. In recent weeks, this extraordinarily civic-minded shooting club had hosted an Appleseed event and a shooting match to benefit Wounded Warriors, one of my favorite charities. They hold firearms safety courses for the public there on a regular basis. 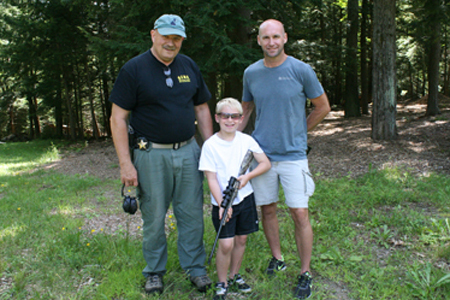 EOC exemplifies how a gun club can be a community asset. While I was there, Dickie Crate dropped by with his eight year old son Owen, both on bicycles. Crate is Chief of Police in Enfield, a solid professional much appreciated by both his officers and his citizens. He and Owen get by the club often, and Owen enjoys shooting his own Crickett rifle there. In talking with the grown-ups, Owen allowed that he’d like to try a telescopic sight on his .22. One of those present was Russ Lary, who retired three years ago after many years as chief of police in neighboring Grantham. He and Chief Crate had a short discussion, and Russ left with young Owen’s rifle. When he met Dickie and Owen on the range again a couple of days later, the rifle had been to Rody’s Gun Shop in nearby Newport, one of my favorite places of its kind. Proprietors Bill and Henry Rodeschin had mounted one of Crickett’s own four-power scopes, and bore-sighted it. They did an excellent job: Owen’s first shots from a standing position centered spot on in the little “X” that Dickie and Russ had taped to the center of the target. Owen was one happy kid. The crickets may be relaxing, but Cricketts gladden this old shooter’s heart…and so do the fine young men and women who shoot them, and the responsible parents who buy Cricketts for them. Info is available at http://www.crickett.com. Owen Crate gets the feel of his newly-scoped Crickett. From left: Chief Lary (ret. ), Owen Crate with Crickett, and Chief Crate. I have a Crickett my grandson gets to shoot every time he comes to visit. The great thing about teaching kids to shoot is they don’t have any bad habits. I have found out in life the first way we learn to do things is how we continue to keep doing them. Teach that child the proper way to handle a firearm when they are young and they will carry that lesson through out their life. The Crickett is fantastic for kids. My 10/22 is to large and it is difficult for children to shoot. 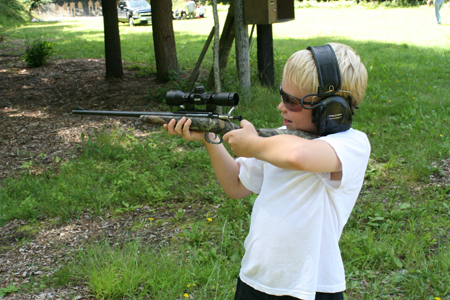 It is a great rifle for older kids but a firearm must fit you if you wish to shoot it well. The Crickett fits those young lads and is a very important firearm in my collection. Funny how first impressions last. My first trigger time was spent behind a range owned BSA Martini cut down for kids. To this day I have biggest crush on Martini actions. Later on I moved to a Rem 510X single shot. It still sits in my gun safe, some 50 years later. I am sure that boy will always remember shooting with his dad. If things haven’t changed much, he may hang on to that Crickett even when he’s biggest enough to play college football. Back when our kids were that age, we bought two Winchester single shots .22 LR weapons, with small 4X scopes on both of them, to allow them to learn the basics of firearms safety, and general marksmanship. At the time we lived in Sunburst, Montana (About 8 miles south of the Canadian Border on Highway 93.). After learning the basics, both boys worked, during the summer school breaks, for the local area farmers. They helped castrating young sheep, clearing rocks, before plowing (Montana land frequently grows more Rocks that anything else naturally), and the farmer also paid them for all the gophers, and other burrowing critters, that they could manage to kill, while out in the fields doing the other chores. With a couple of boxes of .22 LR ammo each, they racked up a whole passel of the little varmints, as well as honing their shooting skills. Later in junior or high school, in Yuma, AZ they both shot on the school’s rifle team, back before Schools were turned into “Gun Free Killing Zones”, for any nut case who wanted his 15 minutes of Glory. Strangely enough, neither of the boys took up hunting or shooting later in life, but at least they knew the basics, should the need arise. PS:The last I knew they both still had these little .22 rifles. I’m glad to hear that I’m not the only guy to scope his child’s Crickett. My girls are both tall so they quickly outgrew the stock on the little pink and stainless rifle. I bought a Blackhawk Axiom stock for my 10/22. The stock is a multi-position stock patterned off of the M4 and allows a wide degree of LOP adjustment. Now we can all use the same rifle for target practice. Nice story Mas! I can’t help but think, however, of the Liberal reaction to this: How irresponsible it is to arm a child! How quickly they forget our heritage and the role firearms played in it. How quickly they dismiss the role that firearms play in providing food, security, and just plain fun, for those that use them. These two men are to be commended for their actions! A great story brought on by some very responsible adults who went the extra steps to make it all happen. Very nice to read. I shot my first rifle, a .22 of course, when I was at summer camp back in the late 50’s. I still remember the aroma of that burned powder and so will young Owen. Ahhh, I can smell it now. Wonderful memories. Awesome! Seeing the smile on his face is the best part of the deal! Every time the wife and I go to bAss Pro, the youngster always wants to hold the pink Crickett…and actually has a pretty good grip on it now, too. She’s 3.5! I look forward to the day I can hand her her own rifle, and take her to the range. That’s great, and I didn’t even know they MADE scopes for them… Gotta remember that! Sounds like an outstanding club, with outstanding members! Owen is a lucky lad to have such fine friends. As a lefty, he has already adapted to the world dominated by right handed shooters. I remember my first .22 single shot rifle, a JC Higgins, that accounted for a large number of cow-tripping groundhogs. It is heartwarming to see a youngster so lovingly guided into responsible gun ownership and all of its rewards. This might be my favorite article so far. It brought back fond memories of learning to shoot and makes me anxious for when I can teach my boy to do so. Great story Mas, and while I enjoy all the articles and stories you post, this one was especially satisfying. Kids like young Owen are the future of this nation, and it is great to see some of them at least haven’t fallen victim to the ‘guns are evil’ campaigns, and are learning the basics of shooting and firearm appreciation. I don’t have any ‘young uns’ myself, but take every possible opportunity I get to go out and shoot with my neighbors who do. Those are truly the most enjoyable days I spend at the range. Happy to see this line of firearms being made. Going to produce a lot of fun both for the kids and their families. Hopefully, and sure they will, safety with firearms will be a big part of the offshoot (no pun intended) of the Cricket. When I was nine year old, I was given a Stevens Model 15-A .22 single-shot rifle. I am 74, and I still have it, in perfect working order. Oh, the stock is dinged here and there, and maybe it’s not as shiny as it once was, but all that falls aside when I look at it. I envy the kids who will be receiving these Crickets, and I wish them all a load of fun. Just remember, Every gun is a loaded gun. My best, Roger K.
Great trip down memory lane Mas. Not too long ago, my dad stopped by and gave my 10 year old son the .22 single shot bolt action he had when he was a kid. I brought back memories because that was the very same long gun I cut my teeth on when I was a pup. I forgot he still had it. A Springfield (mfg by Stevens) model 53-B .22 bolt action. Such a simple gun, yet everything one needs to learn to shoot well and safely handle firearms. On a side note, there are also some great .410 shotguns for kids. Simple single shot break actions with exposed hammers. But you knew that. Also try the Marlin 336Y – out of production but available if you look long enough – when they get old enough for a first deer rifle. The 336Y is short, sights line up fast for those that age (or for women) on shouldering, .30-30 perceived recoil is quite light. Lightweight, too. My son will be 9 yrs old next month, when he was 6 months I bought him a Cricket rifle. About 3 years ago he wanted a scope on his rifle and I call Cricket and ordered a scope mount. It was simple to install and he really enjoyed it. Last year he got a 10/22 for Christmas with a red dot scope, but he still looks into the gun safe and wants to take his Cricket to the range. He told me today, “That rifle looks so little now, his word were do you think it srunk Daddy?” He points out thing that adults do wrong when we go shoot. He knows the four rules and the responseability of firearms. I would not take all the money in the world for the memories we have shooting together. He loves sports and will play any we sign him up for, but he has learn more life lesson looking down the sights of a gun barrel than any team sport has ever taught him. Thanks for the article Mas. Sounds like I need to send Cricket an email also. My brother and I learned quite young how to shoot “long guns” as we always lived in the country. I still have the CrackShot our Dad had as his first rifle. The stock is one he hand-carved at 9 years old as his original had broken. All of my grandchildren (except the 4 year old) know how to handle weapons and the older ones own their own. When my Dad was young, he carried a pocket knife and a rifle to school. When we were in school, we carried pocket knives. Now, kids are not taught HOW to handle and respect weapons of any kind and are becoming dangerous to others and themselves because of that. I believe all kids should be taught weapon safety at a young age and there will be fewer of these gangs who believe it’s “cool” to go out drive-by shooting. They will have been taught that humans are not targets except in war or as self-protection. I would like to see more training programs for kids from reputable sources. Now that I’ve gone completely off track…thank you for raising children who will likely train their own how to own and use weapons safely and without aggression. Great story! I never heard that Kokalis quote, but it makes a heckuva lot of sense. Another cool little rifle for the smaller set is the Thompson/Center Hot Shot. It looks like a micro-sized Encore and is super-easy to open for younger shooters (unlike some T/C pistols). The exposed hammer and single-shot action make it a good choice for safety. Savage is producing their own concept of the Crickett, known as the Rascal. I’m not a huge Savage fan in general, but IMO the Crickett is now an obsolete rifle. The Rascal has an actual Accu-Trigger, a much nicer stock, better options for scope mounting, and doesn’t require the striker to be cocked back on each shot. For very close to the same price. After handling the Rascal, I’m strongly recommending it to anyone who’s thinking of the Crickett – get a much better rifle for almost the same price, it just makes sense. Heh I read the title and thought of the insects. .22s are a great introduction to firearms. I remember shooting a Colt .22 handgun as a kid (don’t remember the model). My favorite .22LR right now is my GSG-5. It always gets attention looking like a HK MP5. Although one .22 I’d like is a AR-15 in .22LR, seems like it’d be a good training tool. With ammo being expensive and hand to come by, .22s make even more sense. Glad to see firearms coming out for everyone. Kids and women especially. Heartwarming column Mas, thanks. Chief Crate and his family and friends are real Americans. Another recent and wonderful .22 story involves an adult, WW2 veteran Earl Jones of Boone County, KY. Jones, 92, lives alone on his 500 acre farm which he still works. Approximately 0200 on 3 Sep 2012, Jones heard intruders in his basement. When one kicked open the door into his living room, Jones shot him once with his .22 rifle, center of mass, killing the perp. Now the bad news: police had to confiscate Jones’ rifle as evidence, and he apparently has no other weapon for defense. Wonder if we could pass the hat with Mas’ help and get him another rifle, or at least a loaner?